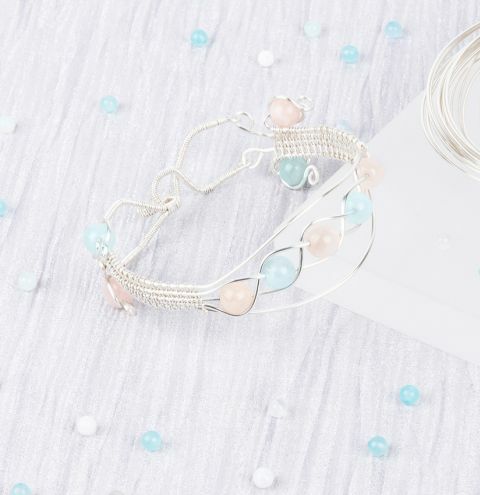 Make a shimmering gemstone bracelet using dyed jade semi-precious beads and wire wrapping techniques. as you can cut off what you dont need later. Straighten each piece. bracelet/bangle. Finish this using round nose pliers and make sure there are no sharp bits. Step 3. Pull/curve the 2 outer wires to either side and place a bead on the middle wire. this use the remaining wires on either side to frame around your braid. depending how big you want your bracelet. Step 6. For the end split wires put a bead on the outside and wire wrap the wire round it. Make a swirl at the top of the bead. Do this on both sides and both ends of bracelet. bangle then make loops with the other two wires. Step 7. Make the clasp - take a piece of 1mm wire and wrap it with the 0.4mm wire. Shape a loop and then bend it at either side for the loop side of the hook clasp. Attach this to the loops at the end of your bracelet. bit you wrapped to create the hook shape. Attach your two clasps to the other side of the bracelet. Now your bracelet/bangle is finished and ready to wear!